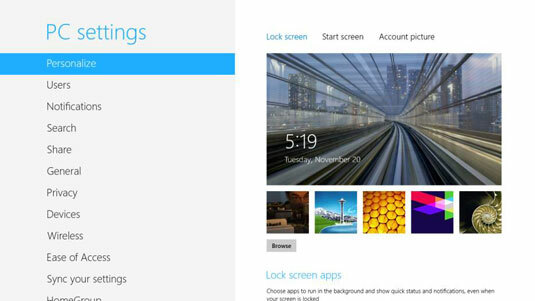 The Start screen’s control panel, called the PC Settings screen, lets you shave off your Windows 8 tablet’s rough edges. Each section in the PC Settings screen lets you customize a different area of your tablet’s behavior. From any screen, slide your finger inward from the right edge to fetch the Charms bar, and then tap the Settings icon. When the Settings pane appears, tap the words Change PC Settings from the bottom edge. The PC Settings screen appears. The pane on the left lists the categories of settings; tap a category, and that category’s options spill out to the right. Your doorway to changing Windows’ appearance, the Personalize screen lets you change three areas: the lock screen that appears when you turn on or wake up your tablet, the Start screen’s background colors and patterns, and your account photo. Lock Screen: Tap the words Lock Screen to see and change your current lock screen photo. Tap one of the existing images, or tap Browse to select your own photo from your Photo library. At the screen’s bottom, choose which icons should display bits of information on the Lock screen. Start Screen: This lets you merge 20 background patterns with 25 colors to create 500 different Start screen combinations. Account Picture: To change your account photo, tap Camera and take a quick snapshot. Or, tap Browse to create an account photo from pictures in your Pictures library. This section lets you upgrade your user account from a Local to a Microsoft account, if desired. Head here to change your password, as well. Chances are, however, you’ll visit here most often to add a new user account to your tablet by tapping the section’s Add a User button. If you’re adding a child, choose to Turn On Family Safety, if desired, so you may monitor their computer use. When one of your apps does something exciting, it sends you a notification: a little box in your screen’s top right corner that displays the reason for the excitement: a new instant message, for example, or an upcoming appointment. Head to the Notifications section to choose which, if any, apps may send announcements, as well as whether they can make noises when doing so. It’s an easy way to silence noisy apps without having to remove them completely from your tablet. The Charm bar’s Search option lets you search for missing apps, lost files, or hard-to-find Settings. Beneath the Apps, Files, and Settings icons, you also see a list of searchable apps. Tap the Search pane’s Maps app, for example, type Alaska, and the Maps app pops up, ready to offer driving directions. If you don’t want an app listed as searchable within the Search pane, this area of PC Settings lets you toggle its removal. If nothing else, it’s an easy way to combat clutter. This rarely used section lets you choose which apps appear on the Share pane’s list of destinations. (To see the Share pane, open the Charms bar and tap Share.) For example, when Facebook graces Windows 8 with an app, this section lets you choose whether to share items with Facebook. Touch Keyboard: The settings offered here apply only to the onscreen keyboard. Screen: Most tablets normally adjust their screen’s brightness automatically, dimming the screen indoors and brightening it when you step outside. But if the constant dimming/brightening drives you batty, tap the Adjust My Screen Brightness Automatically toggle to turn it off. Language: Bilingual tablet owners can tap this to head straight to the Language area of the Desktop app’s Control Panel. Available storage: If you’re running out of storage space, tap this to see a list of apps, sorted with the largest ones at the top. Delete the biggest hogs to regain some space. This bone tossed in for privacy advocates lets you choose whether apps can use your general location (handy with maps and weather) and your name and account picture (used by many social networks). A third option lets Microsoft receive lists of websites used by apps, hopefully so Microsoft can weed out apps doing unscrupulous things. This handy list shows all the devices now-or-once attached to your tablet. Unfortunately, it doesn’t let you do anything but remove them by tapping the minus sign to the right of their name. The gem here is Add a Device, listed at the top. Tap that to add Bluetooth gadgets like mice, keyboards, and headsets. Only three toggle switches live here, but they’re all handy. Tap the Airplane Mode toggle to turn off your Wi-Fi before heading onto a plane. The other two toggles control Wi-Fi and Bluetooth. Feel free to turn off Bluetooth to extend your battery life if you never connect with Bluetooth gadgets like wireless mice and keyboards. For a quick way to turn Airplane Mode on or off, fetch the Charms bar, tap the Settings icon, and tap the Settings pane’s Wireless network icon. When the Networks settings pane appears, tap Airplane Mode to toggle the setting On or Off. These switches help adapt the tablet to people with physical challenges. The High Contrast switch, for example, helps the vision-impaired by reducing all distraction. And Windows’ Narrator, a Windows chestnut for years, reads menus and text with its same robotic tone. Microsoft kindly remembers the settings of Microsoft account owners. Log onto another PC with your Microsoft account, and your settings, passwords, app purchases, favorite websites and more ride along, making that other PC behave much like your own. Tablets running Windows RT can’t start a Homegroup, but they can join an existing one. Tablets running Windows 8, by contrast, can both start and join an existing Homegroup. This section lists the password of the Homegroup you’ve joined, if any. Windows 8 tablets are very new, and updates arrive frequently to fix problems and smooth out rough spots. You can tap Check Updates here to find and install the latest.